The New York media can be tough for sure. When a team in the city doesn’t play well, several interesting theories often emerge as to the root cause of the problem, and scapegoats are quickly indentified. However, nothing in recent times compares to the article that New York Daily News sports editor Jimmy Powers wrote to explain the Yankees’ drop in the standings during the 1940 season. Lou Gehrig wipes away a tear during his famous speech on July 4, 1939. One year later, sports columnist Jimmy Powers would imply that Gehrig infected his former teammates with a disease he didn’t even have. On August 18, 1940, the four-time defending champion Yankees entered action with a pedestrian 56-52 record, which put them in fourth place, 10 games behind the Cleveland Indians. It had been 10 years since the Yankees finished lower than second, so naturally the media spent most of the season trying to figure out the cause of the team’s fall from grace. From an aging pitching staff to a potential injury to Joe DiMaggio, a variety of explanations were advanced, but nothing compared to what screamed from the headlines of the Daily News that morning. “Has ‘Polio’ Hit the Yankees?,” asked the banner of the city’s mostly widely read tabloid. In the accompanying article, Powers, who was as famous for making news as reporting it, suggested the reason the Yankees were languishing in the standings was because they had contracted polio from Lou Gehrig. Has the mysterious ‘polio’ germ which felled Lou Gehrig also struck his former teammates, turning a once great team into a floundering non-contender? According to overwhelming opinion of the medical profession, poliomyelitis, similar to infantile paralysis, is communicable. The Yanks were exposed to it at its most acute stage. They played ball with the afflicted Gehrig, dressed and undressed in the locker room with him, traveled, played cards and ate with him. Isn’t it possible some of them also became infected?” – Jimmy Powers, New York Daily News, August 18, 1940. Powell’s outrageous accusation (Gehrig wasn’t suffering from polio, but amyotrophic lateral sclerosis, a non-communicable disease) was quickly denounced by the Yankees, but a retraction was not forthcoming. As a result, on September 9, 1940, Gehrig decided to seek a legal resolution by filing a $1 million libel law suit against Powers and the Daily News. In seeking restitution, Gehrig’s lawsuit sadly stated that the legendary first baseman had become “a pariah whom many people shun”. Shortly thereafter, 10 other Yankees also decided to file a collective libel suit of their own, asking for $2.5 million in damages. The Daily News finally admitted its mistake over one month latter when its September 26 edition ran a retraction under the headline “Our Apologies To Lou Gehrig And The Yankees.” In the article, Powers admitted that “Gehrig has no communicable disease and was not suffering from the mysterious polio germ that supposedly played havoc with the Yankee ball club,” and apologized for “hurting his feelings”. Gehrig’s suit was subsequently dropped, but media reports as late as October 25, 1940 suggested that the collective libel suit was still being advanced by Gehrig’s teammates. However, no further mention of that suit’s outcome could be found. Incredibly, Powers not only didn’t lose his job for making such a scandalous suggestion, but went on to continue a controversial career that would include other accusations of libel. Meanwhile, the Yankees went on to post the best record (32-14) in baseball from the date of the original article, dispelling any lingering doubt that Powers story may have caused. 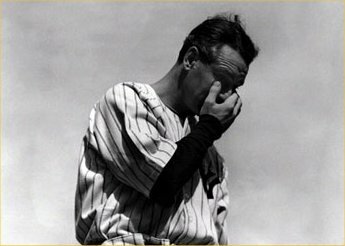 Sadly, the only loser was Gehrig, who had to see his name dragged through the mud in what turned out to be his last time in the spotlight. On June 2, 1941, Lou Gehrig passed away from ALS.